We work with a lot of different people wanting to buy a Tallahassee property, and one question that often arises if they cannot seem to find "the right home" is whether or not they should consider building a new home. Personally, I love building a new home and have had one built from the ground up as well as renovated several in which I lived. It is certainly an exciting process. If money and value are a concern however, now is not going to be the "smart" time to build. It is not because builders won't bend over backwards to give you a great deal, rather it is because the average price of a Tallahassee property has dropped far below what a builder could do for you for an equivalent home. The glut of supply has driven existing home values so low that you simply cannot build one for anywhere near the same price as the homes for sale in the Tallahassee MLS. Of course, if you are at that stage in your life where you really want to create the right home for you, and you know exactly where and what you want to build, then go for it. If you live in the home for 10 or more years, you should be safe in your investment. But if financial safety is a concern, I would strongly encourage you to find a great Tallahassee property that will cost you far less than what it would cost to build today. The real estate graph below shows Tallahassee property values over the past 10 years. Existing home sales are plotted in blue, while new home sales values are plotted in red. As we have repeatedly reported here at the Tallahassee Real Estate Blog, existing home values have been dropping for more than 5 years and are selling well below their replacement costs now. The average new home in 2011 was sold at $134 per square foot, while the average existing home sale closed at only $97 per square foot. As these numbers include the land below the house, you can be sure that building a home will come at a premium. If we compare the average price per square foot of existing home sales to new construction sales, we can determine the "premium" that a homebuyer is going to have to pay to get a new home. 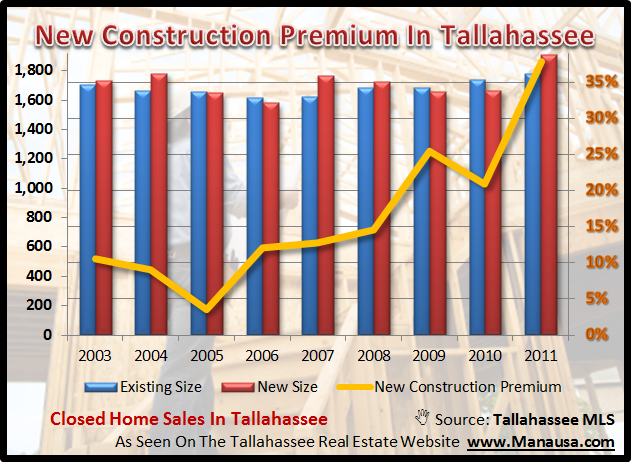 The real estate graph below shows how this premium on a newly built Tallahassee property has changed and has sky rocketed to 38% this year. 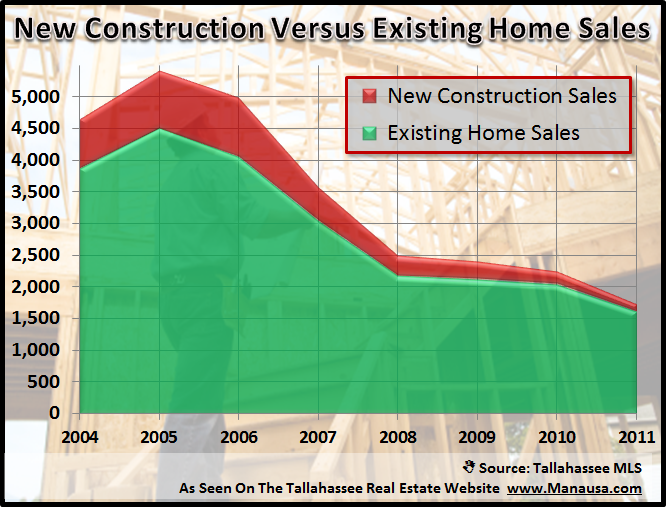 In simple terms, you can expect to pay 38% more for a new home than for a similar sized existing home in Tallahassee. 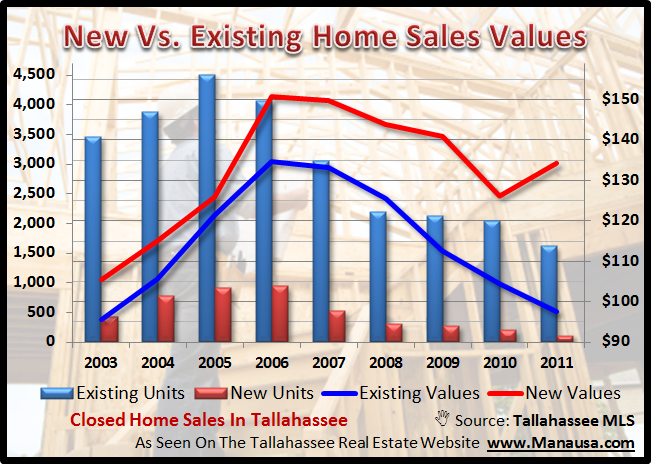 This final real estate graph shows the mix of new home sales to existing home sales each year in Tallahassee. The new construction premium has driven the demand for new homes to an all-time low, and this will remain so long as existing homes glut the supply of homes for sale. It will take several more years for the market to consume the excess inventory of homes before we see a reversal in the decline of Tallahassee property values. The evidence is clear regarding where today's homebuyers are going to find the best values in the Tallahassee real estate market. Existing home sales will continue to offer the best values while the cost for these homes is well below what a home builder can reproduce. While this is bad news for builders, it is great news for homebuyers looking for a great bargain on a Tallahassee property. I totally agree with you about the big picture of new vs existing home price, HOWEVER right now in a few communities such as Southwood or Golden Eagle there are great deals to be had on vacant land, making the land+ new construction package still better than buying existing homes there IMO. These neighborhoods have the amenities or location advantage (or both) that others don't, and are still selling much better than the rest, keeping home price there (new and old) pretty much stable for the last 2 years. As a home buyer, I have been watching the market for almost 3 years and finally decided to buy a lot and build. At current market price, a custom home on the golf course with many upgrades (compared to the spec homes) in one of these communities can be had for less than $120/sqft (including land). With commodity price going down, I'm expecting construction price to come down in the coming months also.